Happy New Year everyone! I hope everyone celebrated the new year in style. I had quite a chilled one this year, it was a lot of fun and it was a lovely way to start the new year off! Unfortunately I've been ill for the last week with tonsillitis so although I felt really positive about my blog I just had no motivation to do anything! Now I'm starting to feel better I thought I'd write a post similar to the one I wrote around this time last year, which was about my goals and a round up of 2013. You can find it here. This year I decided I didn't want to make New Years resolutions. The were very similar ever year and I never really accomplished them. However, I am going to look back at the goals I made last year and make some new blogging ones for the year to come! In terms of the goals I made for life and work, my success rate was pretty much 50/50. My main goal to maintain a healthy lifestyle was a huge fail, but I was successful in other goals. For example, I put myself on a lot of spending bans this year ad starting putting away a little money a week and have managed to build up a bit of savings. I am really happy with this one, I lived to a budget but still enjoyed myself and treated myself to a new lipstick or dress now and again. Sticking to a budget doesn't mean no extra spending, just being sensible. I started switching normal cup of tea for herbal teas more often. I have once again opened my etsy shop and it has gone better than I imagined. I was so terrified of opening it again (what if people complain about it, what if it's not good enough..) but I'm surprised about how it's all going. In the next few weeks I will be hoping to expand with more items and also creating business cards. However, the rest I did not succeed with, but I don't want to dwell on that rather just move forward and aim towards them this year. My blogging goals is where I had the most success. My number one concerning my blog was tweaking me design, I went one step further and bought my own from etsy! I wish I'd done it a lot earlier. It's a really simple, clear layout and makes my blog feel more professional. My second goal was to improve my photography. This is another goal I think I succeeded in after receiving a digital camera for Christmas, however this broke a few months ago and I have been using my iphone since then, but I still think my photos have improved drastically. When I look back at the old photos I can't help but cringe! Finally, I wanted to comment on three blogs a day. Three blogs a day was kind of tricky when I was busy, soI started counting it weekly instead and aimed for around 15 a week. Although some weeks I commented more and others I commented less, I definitely took more time out to comment on other people's posts. 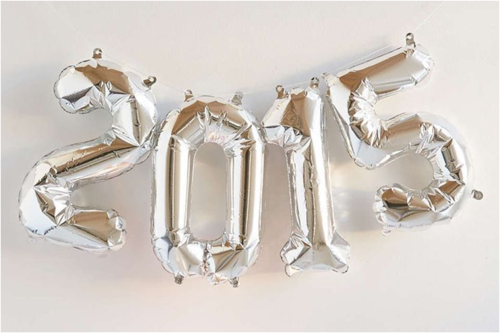 So what do I hope for in 2015? 1. I want to keep improving in all aspects of my blog. 2. I want to bring new and exciting content rather than falling back on the same style of posts regularly. 3. Although my camera I'm using to take blog photos won't change, I want to learn more about the editing process to make my photos as good as they can be. 4. I'm happy that I took time out to comment more on posts that I enjoyed in 2014, so I would like to keep this up in 2015.